In 1860, on the eve of the Civil War, Galveston was the largest city in Texas and the major seaport for the state. The citys population stood at 7,207, about 1,200 of whom were slaves. Galveston was a growing city; forty percent of her non-slave population was born outside the United States. Across the islands wharves in 1860 passed 194,000 bales of cotton, three-quarters of the total shipped from all Texas ports that year. The editor of the Galveston News -- perhaps not an entirely objective judge of the matter -- estimated that Galvestons commerce was growing at the astonishing rate of 50% annually. The idea of secession did not initially enjoy wide support among Galvestonians, but it gained popularity after the election of Abraham Lincoln. In a statewide vote on secession on February 23, 1861, Galvestonians supported breaking with the Union by a landslide, 765 to 33. The Federal blockade of Galveston began on July 2, 1861 with the arrival of U.S.S. South Carolina. The screw-propelled steamer made several quick captures of sailing vessels trying to break new blockade, but these were mostly small, worthless craft. Blockade running was, at that stage of the war, a very amateur and disorganized affair. Despite the patriotic fervor for the Southern cause, though, many people came to recognize that Galveston would be difficult to defend against an expected Union attack. Word got out that the Confederate military thought the city indefensible, and it was reported that the governor had suggested the city be burned rather than fall into Union hands intact. Many Galvestonians left the island for Houston and other cities inland, not to return until 1865. The Federal move on the island was long delayed, but when it finally came in October 1862 it was almost bloodless. Confederate forces evacuated the city (left) and retreated to the mainland. Commander Jonathan M. Wainwright, commanding the Navy gunboat Harriet Lane, took possession of the city and raised the U.S. flag over the old U.S. Customs House. In the early hours of New Years Day, 1863, however, Confederate forces under the command of John Bankhead Magruder launched a bold attack to recapture the city. Confederate infantry moved into the city under the cover of darkness, taking advantage of the Federal troops habit of barricading themselves on the wharves at night, while converted riverboats mounting cannon and piled high with cotton bales attacked the naval vessels in the harbor. The attack ended with an almost complete Confederate victory. Harriet Lane and three Union transports were captured; another gunboat, U.S.S. Westfield, ran aground and was blown up by her own crew to prevent capture. Wainwright and the senior Union officer, Commander William B. Renshaw, were both killed. The Federals never tried to retake Galveston, but reinforced the blockade there in an effort to render it useless as a seaport. 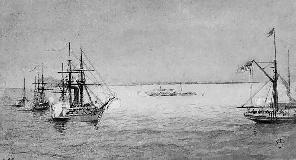 They established a blockade off San Luis Pass, at the western end of Galveston Island, to capture the small schooners that used that access to Galveston Bay. Blockade running continued in a small way in 1863, but as before there was little real effort to resume trade on a large scale. Galveston was geographically too far removed from the center of the war effort to have much importance for the Confederacy as a whole. Life in Galveston became increasingly difficult as the war dragged on. There were shortages of everything -- food, fuel, medicine and clothing -- and those things that could be found sold for tremendously inflated prices. Flour sold at $2 per pound and eggs at $4 per dozen; coffee could command up to $20 per pound. Rations issued to the troops were so bad that one regiment put an inedible slab of beef on a stick, paraded it through the town followed by muffled drums, and after a formal military funeral, buried it on the public square. Fences, sheds and abandoned houses were torn down for firewood. Thefts, assaults and other crime became a common occurrence, as did cases of desertion from the military units on the island. When the Confederate commander at Galveston, General James M. Hawes, ordered the military commissary to stop selling flour to soldiers families, an angry civilian protest led to the so-called "Bread Riot" of 1864. 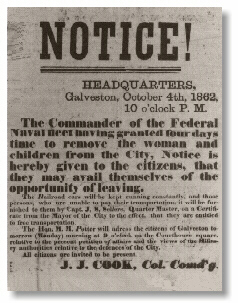 Hawes re-issued an old and forgotten order declaring Galveston to be an "entrenched camp," which effectively placed the citizenry subject to martial law. An epidemic of yellow fever swept through the town in the fall of 1864. Over 100 soldiers, and an unknown number of civilians, died of the disease. Blockade running began to take on a new significance in 1864. After the Battle of Mobile Bay in August 1864, in which Federal navy effectively closed the port of Mobile, Galveston was left as one of the few ports left in the Confederacy and the only one on the Gulf of Mexico. Only a dozen steam blockade runners had come into Galveston during the first three years of the war; now another runner entered the port almost every week. Denbigh made her first run into Galveston at the end of August 1864; she would make five more successful round trips into Galveston before being lost in May 1865. 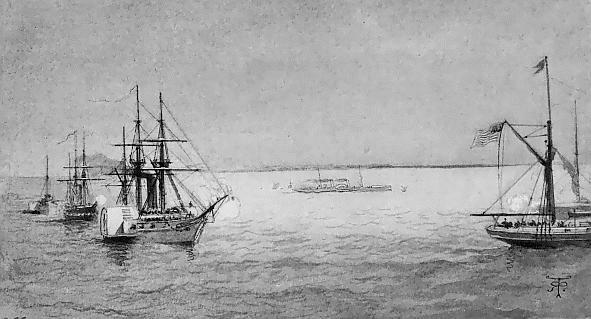 Several blockade runners, including the Laird-built vessels Lark and Wren, made such regular trips to Galveston that they might have challenged Denbighs reputation as "the packet." In 1865, the blockade runner Banshee (II) made a rare daylight dash through the Union fleet into Galveston, relying more on speed and audacity than the runners' usual attribute, stealth. Despite the excitement caused by the regular arrival and departure of the blockade runners, conditions continued to deteriorate in Galveston. An attempt at mass desertion by nearly three hundred Confederate troops was narrowly averted by the personal intervention of Hawes successor in command of the island, Colonel Ashbel Smith. The civilian populace was so desperate that on May 24, 1865 -- the same morning Denbigh was boarded and burned by the Federals -- when the runner Lark entered the harbor, she was swarmed by an unruly mob that stripped the vessel of everything of value. A local historian who witnessed the spectacle as a boy later recalled seeing "stout old women staggering through the streets heavily burdened with sets of artillery harness and other plunder taken from the vessel." After the crowd finally dispersed, Larks captain took aboard Denbighs crew and dashed out to sea again, the last blockade runner to clear a Confederate port. Much of the above material is derived from Edward T. Cotham's Battle on the Bay: The Civil War Struggle for Galveston (Austin: University of Texas Press, 1998). Sunday, July 16, 2000 Revision.